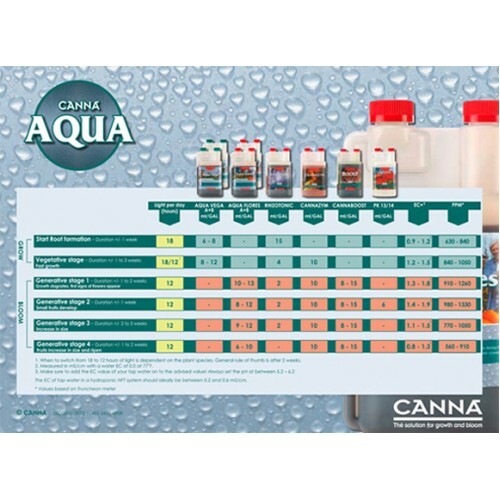 As a rapidly working nutrient for plants, Canna Aqua Vega A&B contains many of the essential elements needed for optimum plant growth and development. This innovative product was created especially to meet the needs of your crop during its growth process to yield a healthy harvest. It is designed for recirculating systems including Flood and Drain, Deep water culture and NFT systems. Canna Aqua Vega will ensure that your plants have strong shoots during the growth process which makes for a strong product upon harvest. It is easy to use and dissolves directly the substrate. 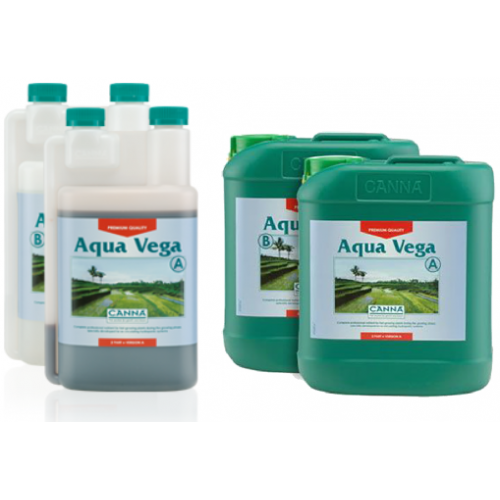 Similar to Canna Aqua Flores, Aqua Vega contains pH stabilisers which enables growers to easily maintain pH levels in the nutrient reservoir. Recommended pH: 5.2-6-2. Be sure to read the instructions on the label before use. Mix equal parts A & B with tap water. However, do not mix them in their together concentrated form. Apply part A first, wait at least 10 minutes and then add Part B. Dosage: 20 ml per 10 l water. Mix thoroughly and let stand for a few hours before use. Not designed for to be used in swampy areas, reed beds, woods, hedges, surface water, on or near groundwater collection areas or in protected nature reserves. Canna Aqua Flores A&BCanna Aqua Flores can help yield a bountiful harvest. It also is designed w..